This is one of my FAVORITE things to make, I seem to always have the ingredients in the house, I either serve it with pasta, rice or gnochi! 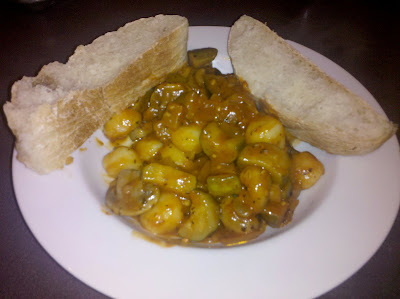 I had some eggplant and zucchini to use up so decided to post it on my blog and share this easy healthy "comfort food" meal. I also ended up making Sweet and Sour Chicken for the kids, no way would my 11 year old eat this..:( I cook all kinds of food and yet my son lives on pb&j, I just don't get it..I don't think any of my kids actually ate this, Maggie was here and LOVED it (shes a veg). I used my electric skillet for this but you can use a large frying pan as well. Over high heat I added the olive oil and garlic, saute for a minute or two. Add Onion and cook till golden brown, add zucchini, eggplant, mushrooms, salt and herbs, cook until veggies carmelize and have a bit of color on them (this enhances the flavor of the sauce) Last step is to add the tomato sauce, I add a tad bit of water too..use your own judgement on this. 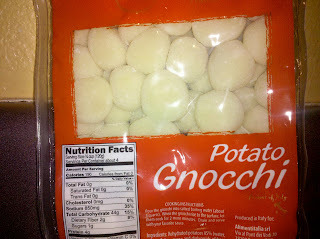 I provided a pic of the gnochi I used, you can find it in the pasta section of most large supermarkets..I DO know how to make my own but, it is very time consuming and had to cheat this time. I plan on a gnochi making day sometime soon, they are great to have in the freezer to pull out as needed. It does look delicious, perfect with the bread you made too!I saw your site from the foodieblogroll and if you won't mind, I'd love to guide foodista readers to your site.Just add a foodista widget at the end of this blog post and it's ready to go.Thanks!